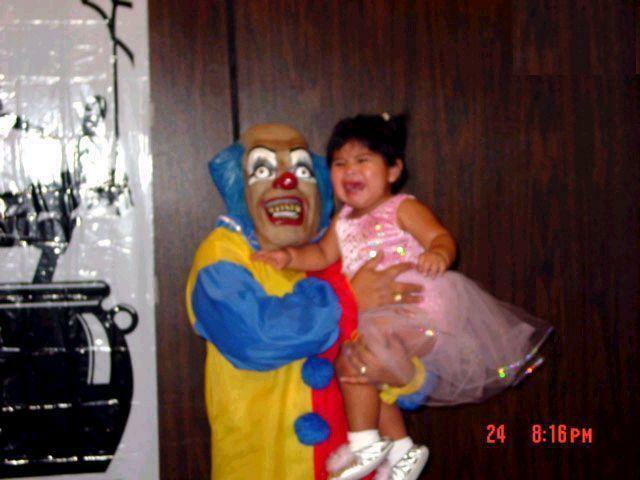 This picture shows the creepiest looking clown on Earth carrying, quite possibly, the most terrified child we’ve ever seen. You now have the pleasure of submitting a caption for it. â€œWow, I knew this clown outfit would be a crowd pleaserâ€. GUIDELINES: The caption should be more or less one line. Weâ€™ll choose the best caption and archive it for posterity. Damn! I knew I shouldn’t have worn those ridiculous sunglasses while tanning yesterday…now look at me. My top teeth really need some work. You’ll make a good meal. Kidnapping 101: You don’t have to blend into the crowd to be successful! And you thought that Burger King dude was creepy!!! Finally, the day of my arranged marriage has arrived! Mamma never told me there would be days like these. Hey mom … dad. I want to introduce you to my new bride.